The Battle of Todd's Tavern was not the largest cavalry battle of the war, but may have been the most important. Confederate horsemen delayed the advance of the Union just long enough so that the Confederate army could win the race to Spotsylvania which extended the war for eleven months. On May 4, 1864, Lieutenant General Ulysses S. Grant led Major General George G. Meade's Union Army of the Potomac across the Rapidan River into the tangles of the Wilderness. Robert E. Lee attacked him there, and in two days of heavy fighting Grant had both flanks turned and took more than 17,000 casualties. Rather than retreat, he issued orders on May 7 for a night march to Spotsylvania Court House, the next stop on the road to Richmond. To get there, his cavalry would first have to clear Confederate cavalry from the Brock Road (American Civil War Cavalry Organization). This would lead to some of the most intense and important cavalry fighting of war around a country crossroads called Todd's Tavern. Major General Phillip H. Sheridan commanded the Union army's cavalry. 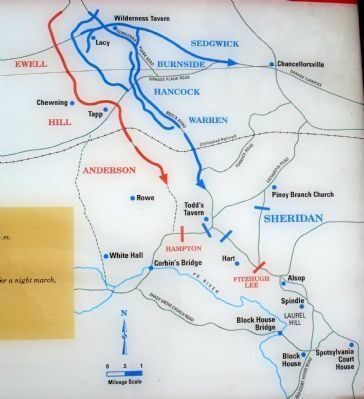 Sheridan had held Todd's Tavern during the Battle of the Wilderness, but had withdrawn his horsemen toward Chancellorsville on the night of May 6th, allowing Major General Fitzhugh Lee's Confederates to reoccupy the intersection. Lee's men occupied and strengthened trenches abandoned by Sheridan near the tavern. Grant's plans to march the army to Spotsylvania required Sheridan to retake Todd's Tavern from Fitz Lee. Sheridan assigned Major Generals Wesley Merritt's and David M. Gregg's divisions to the task. While Merritt advanced south from Catharine Furnace to clear the Brock Road, Gregg would leave his camp at the Aldrich Farm and push west up the Catharpin Road. The two would meet at Todd's Tavern. Once the crossroads was in their hands, Gregg would continue west on the Catharpin Road and seize Corbin's Bridge over the Po River. Sheridan's plan worked to perfection. Fitz Lee met Merritt's advance about 0.75 mile a mile north of Todd's Tavern, but when Gregg appeared on his flank, at Piney Branch Church, he abandoned the crossroads and retreat down the Brock Road toward Spotsylvania. 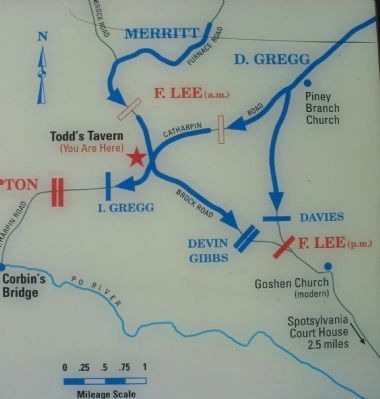 Gregg occupied Todd's Tavern about noon then pushed on to Corbin's Bridge. A mile west of the tavern he ran into Brigadier General Thomas L. Rosser, who commanded a Confederate cavalry brigade in Major General Wade Hampton's division. With Federal repeating rifles blazing away and supported by the fire of two cannon, Gregg forced Rosser's brigade back to Corbin's Bridge. He later withdrew to the tavern when two other brigades of Hampton's division came to Rosser's support. Merritt meanwhile pursued Fitz Lee down the Brock Road toward Spotsylvania. Two miles south of Todd's Tavern, at the junction of the Piney Branch Road, Lee halted and threw up logworks. Merritt attacked him there in the late afternoon on the Brock Road, while Brigadier General Henry E. Davies brigade of Gregg's division advanced against Lee's right via the Piney Branch Road. This fight between Lee and Merritt developed into the deadliest phase of the battle. The 1st New York Dragoons alone lost 91 men in the action, the highest loss of any cavalry regiment in a single engagement during the war. At one point in the battle, the Confederate logworks caught fire, but the soldiers simply shot at one another through the flames. Merritt finally captured the logworks late in the day, but as night drew on he withdrew his division towards Todd's Tavern enabling Lee to reoccupy them. That night, Meade pulled his army out of its trenches in the Wilderness and began marching down the Brock Road toward Spotsylvania Court House. Major General Gouverneur K. Warren's Fifth Corps led the march. Meade ordered Sheridan to clear the road all the way to Spotsylvania, but the orders miscarried, and when Meade reached Todd's Tavern about midnight, he found Gregg's troops in bivouac there. He angrily ordered Merritt to finish clearing the road to Spotsylvania while Gregg pushed out the Catharpin Road to to Corbin's Bridge to protect the army's right flank. Merritt again found Fitz Lee's division still blocking the road. Lee had felled trees across the road to hinder the Union army's advance, and his troops shot at the Federals as they tried to pull them out of the way. Impatient with Merritt's slow progress, Warren at dawn ordered Major General John C. Robinson's infantry division to the front. Robinson's foot soldiers pushed Fitz Lee's troopers back across the Alsop Farm clearing to a slight ridge later called Laurel Hill, less than two miles from the Court House. Lee's men threw down fence rails along the low, wooded crest and again prepared to contest the Union advance. Robinson confidently advanced to attack them. As he did so, two Confederate infantry brigades of Major General Richard H. Anderson's First Corps--the vanguard of Lee's army--came running up from the rear and joined Lee's men along the ridge, and together they hurled the Federals back in confusion. Repeated attacks by Warren failed to crack the Confederate line. Thanks to tenacious fighting on the part of Fitzhugh Lee's troopers, the Southerners had won the race to Spotsylvania. Here, Grant fought and maneuvered to flank Lee out of his heavily fortified earthworks. And Lee demonstrated his genius as a defensive commander, countering Grant's every move. Adding to the melee were cavalry brawls among the likes of Philip H. Sheridan, George A. Custer, James Ewell Brown "Jeb" Stuart, and Wade Hampton. Forty days of combat produced horrific casualties, some 55,000 on the Union side and 35,000 on the Confederate. By the time Grant crossed the James and began the Siege of Petersburg, marking an end to this maneuver, both armies had sustained significant losses that dramatically reduced their numbers. Rhea provides a rich, fast-paced narrative, movingly illustrated by more than sixty powerful color images from Heisey, who captures the many moods of these hallowed battlegrounds as they appear today. Heisey made scores of visits to the areas where Grant and Lee clashed, giving special attention to lesser-known sites on byways and private property. He captures some of central Virginia's most stunning landscapes, reminding us that though battlefields conjure visions of violence, death, and sorrow, they can also be places of beauty and contemplation. Accompanying the modern pictures are more than twenty contemporary photographs taken during the campaign or shortly afterwards, some of them never before published. At once an engaging military history and a vivid pictorial journey, In the Footsteps of Grant and Lee offers a fresh vision of some of the country's most significant historic sites. Includes 61 color illustrations and 15 maps. Recommended Reading: Battle in the Wilderness: Grant Meets Lee (Civil War Campaigns and Commanders), by Grady McWhiney. Description: Designed for those beginning to cultivate an interest in the Civil War, enthusiasts and scholars alike will soon discover the treasure of information contained within the pages of these books. Photographs, biographical sketches and detailed maps are used to illustrate the events of the unfolding drama as each author remains sharply focused on the particular story at hand. Separate and complete, each book conveys the agony, glory, death and wreckage of America's greatest tragedy. He did not retreat after suffering tactical defeats in the battles of the Wilderness, Spotsylvania Courthouse and Cold Harbor, but continued to push his troops ever closer to the rebel capital of Richmond. Not a formal campaign study, this is a dramatic account told through the eyes of soldiers, civilians and government leaders. One of the elements that historian Trudeau dramatizes is the shifting emotional reaction of President Lincoln as he worried whether Grant would prove as faint-hearted as other generals who had faced Lee in the field. When word was brought from Grant that "There is no turning back," the president literally kissed the messenger, for this was probably the most important of several historic turning-points in the four-year Civil War. Includes numerous illustrations. The eight essays here assembled explore aspects of the background, conduct, and repercussions of the fighting in the Wilderness. Through an often-revisionist lens, contributors to this volume focus on topics such as civilian expectations for the campaign, morale in the two armies, and the generalship of Lee, Grant, Philip H. Sheridan, Richard S. Ewell, A. P. Hill, James Longstreet, and Lewis Armistead. Taken together, these essays revise and enhance existing work on the battle, highlighting ways in which the military and nonmilitary spheres of war intersected in the Wilderness. Organized in a chronological framework, the book uses the words of the soldiers themselves to provide a view of the army's experiences in camp, on the march, in combat, and under siege--from the battles in the Wilderness to the final retreat to Appomattox. It sheds new light on such questions as the state of morale in the army, the causes of desertion, ties between the army and the home front, the debate over arming black men in the Confederacy, and the causes of Confederate defeat. Remarkably rich and detailed, Lee's Miserables offers a fresh look at one of the most-studied Civil War armies. Grant relied too heavily on the Army of the Potomac's commander, George Gordon Meade, who failed to coordinate the movements of subordinates disoriented by the broken ground they fought over. Rhea also criticizes Lee for consistently taking the offensive with an army that could not afford the major losses it sustained in attacking. History Book Club main selection.